There are many reasons why more and more roofing contractors are choosing synthetic underlayment for their projects. One of those reasons is safety. Synthetic underlayment comes with a couple of safety features that traditional felt underlayment just can’t match. 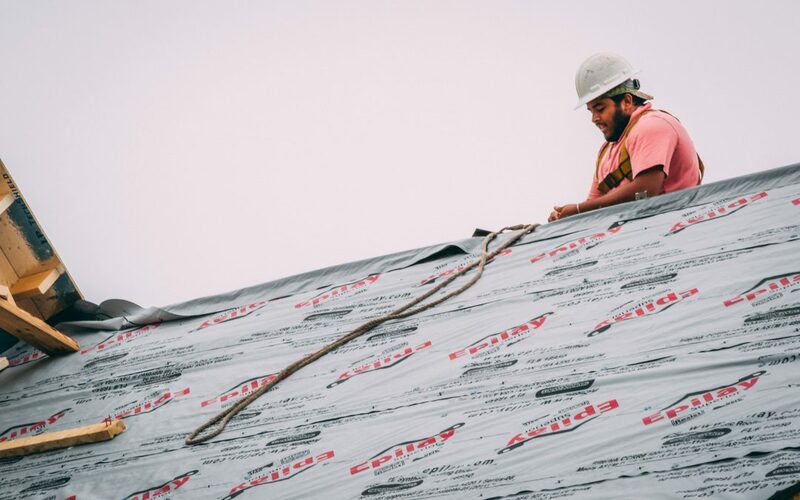 Read on to learn more about how Epilay’s roof underlayment can help you make sure that the job gets done with fewer accidents! Any discussion of roofing contractor safety revolves around protection against falls. And it’s no small wonder, since falls make up the majority of roofing accidents. Data from the Occupational Safety and Health Administration shows that while construction workers make up only 8% of the workforce, these workers suffer 22% of total workplace fatalities. Statistics from 2012 show that falls, specifically, led to 279 fatalities. U.S. Bureau of Labor Statistics data reveals that among roofers, falls are the biggest danger, leading to 37 deaths between the years of 1992 and 1998. About half of these falls were from heights of 20 feet or less, which means low rooftops or falls from ladders. With these thoughts in mind, it’s important to choose tools, equipment and even roofing materials with safety in mind. Since the biggest hazard on roofing jobs is the height and the potential for a fall, contractors appreciate materials that help minimize this risk. Epilay’s synthetic underlayment is one way to help make the work safer. Because each roll is up to ten times lighter than standard #15 and #30 felt underlayment, it’s far easier to work with. Roofing jobs require many trips up and down a ladder, often carrying heavy materials, so lighter rolls of underlayment help minimize the risk to workers carrying these supplies to the rooftop. Once on top of the roof, the rolls are easier to maneuver — less hassle for workers to unroll and place the underlayment means less accidents and injuries. Many roofs are pitched, some steeper than others, and traditional felt underlayment can be slippery, which has been known to result in falls. That’s another advantage to synthetic underlayment. With Epilay’s products, you’ll enjoy the benefits of the GripWalk system. This is a non-woven high-traction surface that is easy to walk on, even on steeply sloped roofs. The surface layer is designed to perform well in all conditions, too, which means that it will provide workers with extra traction even when there is moisture or condensation on the surface of the underlayment. The slip-resistant surface isn’t the only advantage to GripWalk. GripWalk also features a cool gray surface, which helps keep temperatures lower on the rooftop. As anyone who has worked on a roof in the summer knows, heat exhaustion and heat stroke are real dangers, so a cooler working surface minimizes risk to employees and helps the work proceed smoothly. If you’re interested in trying an Epilay product for your next roofing project, get in touch with us to find a distributor in your area. You can also browse our synthetic roofing products to learn more about each of our underlayment options and their advantages. I have had issues with synthetics leaking in the past. I did staple it down. Is yours going to leak. How must it be attached? Hi Mike! Our plystik plus does not require any fasteners making that line waterproof. We have our installation instructions on our website. There are several factors to be considered. How long is it going to be exposed? What is the weather like and what is it going to be? We would suggest that you follow the installation instructions and take proper precautions.